Catherine Laboure was born May 2, 1806 in the town of Fain-les-Moutiers in Burgundy, France. She was the eighth child of a devout couple, Pierre and Madeleine Laboure. When Catherine was nine years old, her mother died. She was brokenhearted and she went to the kitchen, took a small statue of our Lady, and said: "From now on, YOU will be my Mother." The eldest of the Laboure children, Marie-Louise, taught Catherine and her young sister, Tonine, how to care for the household chores. Before too long, the girls were able to assume these responsibilities. So, when Marie-Louise announced she was going to fulfill her lifelong dream of becoming a Daughter of Charity, Catherine and Tonine were ready to take care of the house. Catherine was a devout child and would often walk four miles to attend mass in the church there. When Catherine was 12, she made her First Communion in that church where she had been attending daily mass. 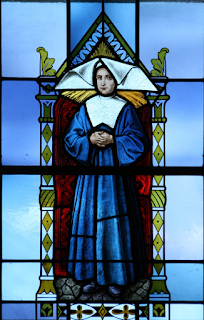 Catherine wanted to follow in Marie-Louise's footsteps and become a Daughter of Charity. She knew she had to be able to read and write and she had not been able to attend school as a child. When she was 18, she asked her father is she could go to Chatillon to live with her cousin who had a finishing school. There, she learned to read and write. Catherine began her postulancy with the Daughters of Charity in Chatillon when she was 24. Three months later, she went to Paris to become a seminary sister. In her daily life, there was nothing to distinguish Catherine from the other young sisters. From the time that Catherine was young, she had a great love and devotion for our Blessed Mother. In fact, she had a great desire to SEE her and often prayed for this. On July 18, the novice directress spoke about St. Vincent de Paul's devotion to the Blessed Virgin. That evening, when Catherine went to bed, she had a feeling she would see Mary that night. 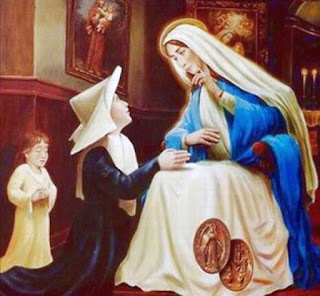 Around 11:30 that night, Catherine was awakened by a small child who told her to get up and get dressed as the Blessed Mother was waiting for her in the chapel. When she arrived there, she noticed it was all lit up. as it was for midnight mass. Before long, the Blessed Mother appeared and sat in the chair which was usually used by the director. Catherine knelt and placed her hands on the Blessed Mother's lap. They spoke for about two hours, during which the Blessed Mother told Catherine that God wanted to give her a "mission." "She held an orb in her hands representing the earthly globe... Her face was utterly beautiful... And suddenly, I saw rings on her fingers covered with precious stones, one more beautiful than the other...At that moment, an oval frame formed around the Holy Virgin and on it were the words in gold letters 'O Mary conceived without sin, pray for us who have recourse to you.' Then, I heard a voice saying to me 'Have a medal struck on this model; everyone who wears it will receive great graces; the graces will be inexhaustible for all those who wear it with confidence.' The picture suddenly turned and I saw the reverse of the medal with the letter M surmounted by a cross and, below it, two hearts, one encircled with a crown of thorns and the other pierced with a sword." Sister Catherine, after receiving her habit, was sent to a hospice in Enghein. There, she cared for retired servants of the royal houses of Orleans. She spent 50 years caring for these retired men, treating them kindly but was firm with them when it was necessary. In November of 1876, Sister Catherine's health declined. She was no longer able to leave her room. She knew she would not see the new year and asked to receive the Sacrament of the Sick. On evening of December 31, Sister Catherine died quietly. Her face was radiant! Tell me what You would have me do." I am content and I thank Him. Since I do not deserve to receive anything more than that. Everything that is in my heart. For with the good Lord, you have to both speak and listen. God always speaks to you when you approach Him plainly and simply. Let us allow God to speak to us in this way! Happy Feast of St. Catherine Laboure! Written by Sister Camille Cuadra, D.C.